Labour has called on David Willetts to withdraw comments in which he appeared to suggest feminism was the "single biggest factor" responsible for a lack of social mobility. The universities minister gave a briefing to journalists travelling with Nick Clegg in Mexico, ahead of the publication by the government of a social mobility strategy. Asked what was to blame for a lack of social mobility the Daily Telegraph quoted him saying: "The feminist revolution in its first-round effects was probably the key factor. "Feminism trumped egalitarianism. It is not that I am against feminism, it's just that is probably the single biggest factor." 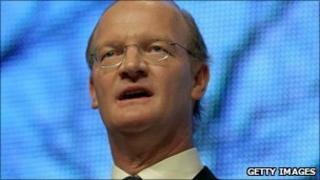 A spokesman at Mr Willetts' department said they had not disputed the quotes in the article. The newspaper reported Mr Willetts as saying there had been an "entirely admirable transformation of opportunities for women" which meant that "with a lot of the expansion of education in the 1960s, 70s and 80s, the first beneficiaries were the daughters of middle-class families who had previously been excluded from educational opportunities". And he added: "If you put that with what is called 'assortative mating' - that well-educated women marry well-educated men - this transformation of opportunities for women ended up magnifying social divides. "It is delicate territory because it is not a bad thing that women had these opportunities, but it widened the gap in household incomes because you suddenly had two-earner couples, both of whom were well-educated, compared with often workless households where nobody was educated." Yvette Cooper, who is both shadow home secretary and shadow minister for women and equalities, criticised the comments and said they should be withdrawn. She said: "Now we see why this Tory-led government is hitting women twice as hard as men. Instead of addressing the problems and disadvantages low-income families face, senior Tory ministers have decided women and feminism are to blame." She added: "David Willetts should quickly withdraw this rubbish and face up to the real problems his policies are causing for young people and women who want to get on." Mr Willetts made a similar case in his book, published last year, titled The Pinch. Why is social mobility still such a problem?